In this passage we see, Hagar, the Egyptian handmade of Sarai, who was given to Abram to bear him a child. We all know the story. Sarai is unable to conceive, and taking matters into her own hands (rather than trusting YHWH to keep His promise that a son would be borne to her), decides she will manipulate the situation and gain children through her servant. 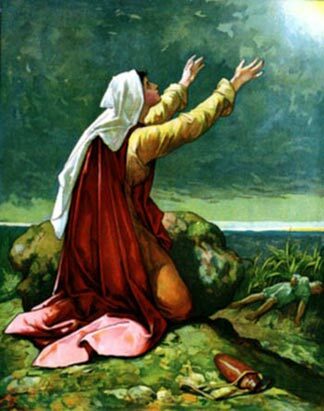 After giving birth to Ishmael, Abram's first son, Hagar suffers the jealousy and wrath of Sarai, and runs off to the wilderness, willing to allow herself and her unborn child to die, rather than suffer anymore abuse. But she is visited by Angel of the Lord, who tells her that YHWH has heard and paid attention to her suffering and persecution. And she will give birth to a son, whom she is to name Ishmael (God hears). At that moment she can bear anything, knowing that she has met a God who sees her and hears her. She is not insignificant, nor is her situation ignored. NOTE: This is the first occurrence of “Angel of the Lord (YHWH)” in Scripture. The Hebrew word for “angel” means “messenger” (an angel of God is a special messenger from God who speaks for and is closely identified with Him). Many Bible scholars believe that this Angel may be a theophany, that is, a physical manifestation of God, in which case the word Angel is capitalized. The Angel of the Lord may, based on context, be the pre-incarnate Christ, the Son of God. Various versions of the Bible either capitalize, or not, the word "angel". I happen to believe that this is Jesus, and not an unidentifiable messenger from God. Moving on, I can't tell you how many people -- especially women -- who have found their way to our ministry because of similar circumstances as Hagar. By that, I mean, they are suffering in their personal lives because they feel that no one is listening to them. They desperately need to be heard and their lives validated. They are often living is such spiritual prisons, that they fear no one knows the truth of their lives. But when we can show them that, just like Hagar, Jesus has been listening to their prayers and has seen everything that has gone on in their lives, and is El Roi (the God who sees me), then they can begin to let His Light shine into their darkness. Knowing that He knows their truth can be such a liberating event. And, almost without exception, they are surprised to be able to go into the spirit realm and see Him present at each point in their lives when they thought they were suffering alone. It is quite natural, and understandable, that they often ask, "If You were there, why didn't You stop the hurtful outcome or change the situation"? With every person, His answer is different and unique to their circumstances. As I have proposed in a previous post, God (and Jesus) will not subvert His universal law of free will. Whether the hurtful period in one's life is caused by our own free will decision to sin, or the free will act of another to harm us, God has given us the option to reach out to Him for repentance, healing, and restoration. That cements a very deep and personal relationship between us and our Savior. If God just stepped in and stopped the sin and abuse, would we ever make an effort to establish such a holy and sanctified relationship? Would we ever turn to Him on our own, and why would we ever have to acknowledge His power, if we never needed to be set free? In the well-known story of Abram, Sarai, and Hagar, God shows us that He is truly El Roi ... God never sleeps, He sees, He is aware, He is the great Omnipresent God. But I want to take it one step further ... what if in the darkest hour of your torment, you are able to actually connect with Him in your spirit? What if you can hear Him say, just like Hagar did, "I hear you, and I see you"! And what if you learned that He is there all the time, and you can visit with Him anytime and as often as you like? What if your spirit could receive affirmation that He values you and wants you to see yourself as He sees you; as a child of God, as a Princess of the Kingdom? And what if He wants to show you your real Truth -- not what the world has projected on to your mind's screen? Can you see that this passage is giving us a precise picture of the healing power of Jesus as we encounter Him in the spirit? And can you see how much more effective this can be than secular counseling, or even pastoral counseling? Because I can tell you that if a counselor never invites Jesus in to have a personal encounter with the hurting and wounded, then all the secular psychology or sermons on the characteristics of a Biblical wife will never make the wounded feel they've been heard. Only a one-on-one meeting between Jesus and the afflicted (as happened in Genesis 16) will begin the healing process.